Yesterday, I blogged about the Dutch astronaut wearing a Seiko during his STS61A mission in 1985. It seems that the Seiko handed out to the astronauts of mid-1980s missions, is the digital chrono A829-6019 model as pictured below. It was available in two versions, the SMGG11 and the SMGG13 (black bezel and LCD inlay). 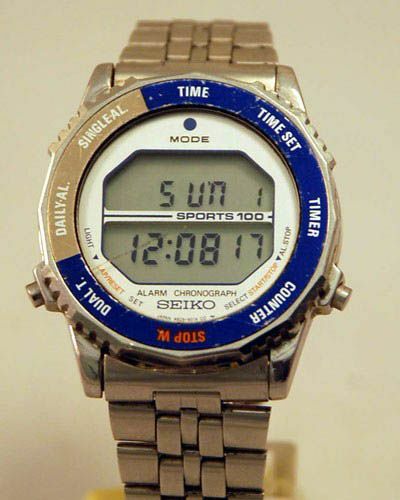 The picture above was found on The Digital Watch Library and it says that this watch was produced in 1982. Furthemore, the website states that these watches have not been “assigned” or selected by NASA, and were only “personal” choices made by the astronauts themselves. However, Dutch astronaut Wubbo Ockels cleary states in an interview in a recent magazine (belonging to HP De Tijd) that he received his one from NASA. I found one on eBay, click here. It is currently on there for $425, is that too much to ask for NASA equipment?